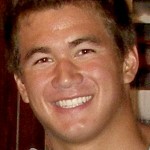 Bremerton’s Nathan Adrian won the 100-yard freestyle in an American record time at the NCAA Men’s Swimming and Diving championships on Saturday in College Station, Texas. Adrian, a 2006 Bremerton High School graduate and current sophomore at California-Berkeley, won the event in 41.08 seconds, bettering his morning preliminary time of 41.86 by a narrow margin. Adrian held off James Feigen of Texas, who finished in 41.49. Adrian also beat Feigen in the 50 free. On Thursday, Adrian broke his own American record in the 50 freestyle, winning his first NCAA championship in 18.71 seconds. Adrian won a gold medal at the 2008 Beijing Olympics as a member of he United States 400 free relay, competing in the prelims. Also, check out this video of Nathan by floswimming.org, taken on the final day of the meet.